I had only had a passing glimpse of the Thanthirimale area in 1974, when an elderly friend of mine, Nichulus Aiya and I got the idea of doing chena cultivation. People of my age remember the 70s were difficult years. There were scarcities and prices of certain products were high and some of them not available. It was the period of ‘Haal Polla’.There was a scarcity of dry chillies, chillies were fetching high prices in the market in Colombo. We wanted to try our hand at chillie cultivation and we got a land at MahaVilachchiya, 25 acres in extent at Rs. 800. Maha Vilachchiya was accessible from Mannaram Handiya, after passing the gravel road junction leading to the Thanthirimale area. CTB buses were plying the Vilachchiya road and the service was regular and good. 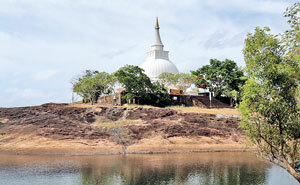 We used to get to Anuradhapura by the early morning train from Fort and take the bus to Vilachchiya. We did this cultivation for about two years, Nichulus Aiya staying at the small house we had built at the site and I going every weekend to help him, since I was employed in Colombo. We had to give this up after Nichulus Aiya got malaria. I took even a loan from the Bank of Ceylon, at Pemaduwa Branch, to help me with the cultivation work. We made a good income cultivating chillies, maize (corn), and rice varieties that grew in the arid zone. Protecting the maize from the monkeys was indeed a challenge. One day a young man who was helping with our cultivation work suggested that we go and have a look at an ancient temple among the rocks – Thanthirimale. So we took the bus on a Sunday and came to the Thanthirimale junction. We had taken with us a few rotis and a bottle of water. The young man, who was the Wel Vidane’s son had warned us that the trip would be tiring. After we started walking for about two miles we met a hand tiller tractor going very close to Thanthirimale temple and we got a welcome but precarious ride to the site. We reached the temple site before noon. I remember meeting two elderly men who were seated under the shade of a tree, having a meal of kurakkan pittu. They were doing some work for the archaeological officers who were expected in the evening. When we inquired they said that Loku Hamuduruwo had gone to Elayapattuwa to preach Bana. The Loku Hamuduruwo was Ven. Wimalagnana, the former Incumbent. As both of us happened to be Catholics we were eager to find out about this Buddhist temple. Then there was no Chetiya or the Budu Medura, but the ponds were full of water and water lilies in bloom. There were several statues carved out of rock. Two young Buddhist priests were bathing in one of the ponds and we chatted with them before venturing to climb another big rock across from the ponds. As we started doing so I saw some fresh elephant dung around and we had to be very alert. Wel Vidane’s son had warned us about wild life including leopards, but we saw only peacocks and wild boar. Later I made a serious study of the Thanthirimale site and came to know about its glorious history. How Sangamitta Theri and the procession taking the Sacred Bo sapling to Anuradhapura had stopped over at this place, then known as the village of Brahmin Thiwakka. Quite by chance we got a lift back to Thanthirimale junction in an Archaeological Department vehicle going to Anuradhapura, and one official gave us some interesting details about this sacred place. Though I had an idea of visiting again that opportunity came 30 years later when I was assigned to go there as part of the Aloka Pooja Team of Wijeya Newspapers, by my boss. The management and staff of Wijeya Newspapers took up the challenge at a very difficult and inhospitable time, to go to Thanthirimale for an Aloka Pooja and light up the temple and its precincts, and in the process illuminated a vast, ancient and magnificent village. My visit there in 2004 was much more interesting. I learned a lot from the present Loku Hamuduruwo Ven. Chandrarathana Thera when I met him at this hallowed place. Many of us who have visited this sacred place several times since, are fascinated by it and admire everyone who is doing something to improve the conditions there. Looking back at our humble contribution, we are ever thankful to our Management for giving us this opportunity.